Today is Day 9 of #Blogtober17 - the prompt is Ice Cream. I couldn't think of anything about ice cream so instead here is I SCREAM!! I don't believe in ghosts but (there's always a but) I have heard lots of stories, my neighbour saw one in a chateaux in France this year which reminded me of an event many, many years ago. I worked in operating theatres for many years and one of the theatres was said to be haunted. It was a woman in white (aren't they all?) who was said to wander around the corridors and had been seen by many late at night. One evening I was working with a few colleagues and all except one were busy dealing in the anaesthetic room with an emergency patient. As the patient was taken into theatre the doors opened and in rushed a very pale member of staff (the only one not with us previously) she walked straight up to my colleague and hit him on the arm (we're a close bunch, this is not assault haha!) saying "Don't ever do that again, you frightened the hell out of me!" "You know exactly what I meant" she said "creeping up behind me, tapping me on the shoulder and then hiding"
It couldn't have been my colleague, we'd been together working for at least an hour. He hadn't left the room, nor had anyone else. Goosebumps!! Needless to say we went in pairs for the rest of the shift. Seeing as Hallowe'en is just around the corner I asked some bloggers if they had ever seen a ghost, or had a ghostly experience. They had! These are all true and in their own words. Lock the doors, hang out the garlic and when you are ready, read on. When I was a child I was at a friends house for a party and they lived in an old cottage. We were playing hide and seek in the dark and the rules were that no one was allowed to hide upstairs, only in the living areas. I hid at the bottom of the stairs and happened to look up to the top and there was a little girl stood as clear as day on the top stair dressed in a long white night dress, it almost looked Victorian. I began screaming and then shouting to turn the lights on. I remember going mad saying there's someone upstairs, you said no one was to hide up there and so on but when the lights came on and the parents came to check there wasn't anyone hiding up there and no one had come down. We lived in a haunted flat. Our first place together & right from the start we both had a really ominous feeling about the staircase up to the bedroom & bathroom. When sat in the living room, we would shut the door to the stairs because it just made us feel uncomfortable. One night, my other half felt what felt like a dog brush past him at the top of the stairs, yet there was nothing there. Then on our last night, just as we were due to move out, we were woken by a loud bang out on the landing & a flash of light. Other half went out to investigate but there was no sign of anything, then the boiler started 'bubbling', something it hadn't done once in the 6mths we'd been there, before stopping & everything going quiet again. We couldn't get out of there fast enough the next day. There was a ghost in the house I grew up in. I woke up one night and a girl of around 8 was sitting on the edge of my bed in Victorian dress holding her hand out to me. My parents decided to research the house - mostly to prove to me that nothing happened there. When they did they found out that a little girl died in a house fire there decades ago. I have believed ever since! Some people don't believe but I certainly do. Until you see something yourself you won't believe. My family have a sort of sixth sense. I have lots of stories, some nice and some scary. I lived at my moms house for a short while. There was more than one spirit there. My 4 year old at the time could see really scary things. (He never saw graphic films etc so wasn't put into his head) One day we all sat in my parents room on the bed whilst my son stood at the end of the bed. He started looking around the room saying there's blood everywhere! All over the walls! I asked what he could see and he turned to me and looked at me for a few seconds then looked at my foot hanging off the side of the bed and said "I'd move your foot if I was you, or I'll cut it off!" In an aggressive voice. Then he turned and started talking about the road outside saying there was an accident but it happened before the new road was built. We looked into it and it was a new road. The old road was on the front of the house and the new road was built behind. How did he know that? And if he made it up how could a 4 year old think of a story like that? Believe me or not this is a true story. I have many more too. My mum died when I was 10, all through my adult life I have had knocking on my bedroom or front door. One night I had a discussion with my then partner about it, who wasn't a believer in ghosts. I told him how after a few months the knocking had started again and I wondered if it was my mum doing it. Just as I said this our front door knocked! No one was there. I think I got the answer to the question I asked! When I was younger, there were two women who would wake me up most nights. They'd be stood in my bedroom doorway arguing with each other, very old ladies sort of hovering above me. I'd sit there below them, just watching them. I saw them for a long period of time, night after night. It didn't scare me, but I didn't understand why they were there and it made me paranoid about who might have lived in our house before us! We used to live in a house which dated from the early 1800s. Every time I lost something I would stand in the front room and announce what I had lost, go away, come back half an hour or so later and said item would be in the hall. On the floor, in the middle of the hall. It was the weirdest thing. My husband thought that it was a case of not being able to see what was in front of my face, but when we moved our eldest son said that he was glad that when we moved the man didn't come with us. I asked him which man he was talking about, and he said the one that spent the night standing in front of the (built in) cupboard on the landing. I asked if he saw him very often and he said yes he was there loads, sometimes with a little girl called Mary who wasn't so bad but the man looked scary. I'm glad that I didn't know that when we lived there! Although the downside is that now when I lose things nobody is around to help me find them! I have had quite a few experiences over the years and feel that I can sense atmospheres in different houses. I used to work in a care home, that used to be a hotel, years previously. On two occasions I woke up (we did sleepover shifts) with someone standing over the bed looking down at me and another time I sensed someone sitting on the bed next to me. I was pretty scared and slept from then on, on the sofa where the waking night staff worked! There were parts of the house that I hated going into on my own. We also have an old cupboard which has been passed through the family. I used it as a bedside table for a while until I woke up to see either a child or small person walk towards the cupboard, as if to take something out. It also happened to my husband. I didn't feel scared on this occasion, but the cupboard has been moved to another part of the house. I'm not sure whether this is all due to an active imagination or tiredness but I believe deep down that there is something there, as there is too much coincidence. I saw a living ghost once as in I saw someone who I knew really well and it turned out he was somewhere else entirely at the time. You can come out from behind the sofa! 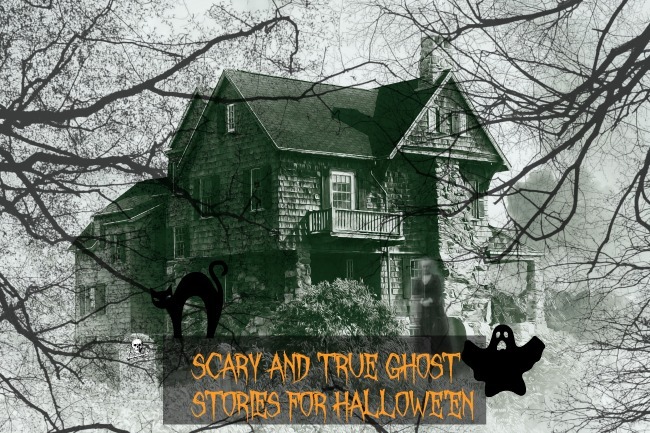 Do you have any true, and scary ghost stories? Please share them with us in the comments. hehehe! Fab post! Very clever!